ADL Associates Ltd have a variety of training courses to meet the needs of any industry. We have a wide ranging portfolio of material that will meet all of your health & safety, food safety and environmental training objectives. Our training portfolio includes accredited training from Qualsafe Awards, CIEH, IOSH, IEMA and a selection of non-accredited in-house training. We are also able to create any bespoke course you require to meet your business’ individual needs. Bespoke courses can incorporate your own assessment methodology and the existing site paperwork your employees use on a daily basis. Through our associated network of companies we can also offer a full range of bespoke driver training courses, including fork lift truck driver training and ADR courses. Please contact us for more information on driver training. Looking For An Open Course? IOSH courses provide insight and practical tools to promote a safety and health culture in which everyone plays their part. Our IOSH courses can also reduce sickness absence, increase productivity and improve an organisation’s reputation. Working safely is a one day course for people at any level, in any sector, needing grounding in the essentials of health and safety. Working safely meets the government’s guidelines for introductory health and safety training and meets the Health and Safety Executive’s ‘passport’ syllabus. Managing safely is for managers and supervisors in any sector, and any organisation. It’s designed to get individuals in those roles up to speed on the practical actions they need to take to handle health and safety in their teams. The 4 or 5 day course gives a more depth look at assessing risks, controlling risks and measuring performance. ADL Associates are approved by Qualsafe Awards, an Awarding Organisation recognised by Ofqual to offer regulated qualifications in a range of subjects. This half day course is for employees to gain awareness of health and safety in the workplace. This half day course is for employees who work in environments with hazardous substances, including cleaning, manufacturing, transport or healthcare. Attendees will develop an understanding of hazardous substances, how risk assessments contribute to safe use of hazardous substances and the controls required. This two day course is for individuals with a responsibility to conduct risk assessments in low risk environments or those who contribute to the risk assessment process in their workplace. This one day course is for employees to raise their awareness of health and safety in the workplace. This one day course is for anyone that requires a basic introduction into the principles of risk assessment. This four day course is for supervisors, managers or individuals looking to progress to such a level and want to increase their health and safety understanding. This half day course is for employees that carry out manual handling in their workplace or for others to increase their awareness of the risks associated with unsafe manual handling. For those requiring practical training should undertake the QA Level 2 Award in Safe Moving and Handling (QCF). This one day course is for employees that carry out manual handling in their work place, including warehouses and shops. Attendees will learn the principles of manual handling and practice a wide range of techniques. This half day course is designed for those who want to increase their awareness of fire safety in the workplace. This one day course is designed for those who are responsible for fire safety in the workplace, such as Fire Wardens / Fire Marshals. This three day course is for individuals appointed to act as a First Aider in their workplace or provide first aid in voluntary & community activities. This half day course is for individuals that have a specific interest or responsibility at work, in voluntary or community activities to Basic Life Support when dealing with an emergency situation that may involve use of an AED. We can also provide this course as a bolt on to the other first aid courses listed on this page. This half day course is for individuals that have a specific responsibility at work, home, in voluntary or community activities to provide basic life support and manage anaphylaxis when dealing with an emergency. This two day course is for individuals that have a specific responsibility at work, home, in voluntary or community activities to provide first aid when dealing with emergencies whilst undertaking activities such as sports, swimming, hiking or rock climbing. This half day course is for qualified first aiders to update their first aid skills yearly until re-qualification training is required. This one day course is for individuals appointed to provide first aid in their workplace or provide basic first aid in voluntary & community activities. This half day course is for individuals that have a specific responsibility at work, in voluntary or community activities to provide first aid and / or use an AED in an emergency. This one day course is for individuals that have a specific responsibility at work, home, in voluntary or community activities to provide basic first aid when dealing with emergencies. This half day course is for individuals that need to provide basic life support in their workplace, voluntary or community activities and can also be useful for qualified individuals to refresh their knowledge and skills further. This short course is for individuals that have previously qualified as a first aider and for others that require practical knowledge of using an AED. This one day course is for individuals working in, or planning to work in, the food catering industry and others that may come in to contact with food handling areas. This one day course is for individuals working in, or planning to work in, food manufacturing environments. This three day course is for individuals working in or preparing to work in a supervisory role within food retail workplaces. This three day course is for supervisors and managers in food manufacturing that assist in the development and maintenance of HACCP based food safety management procedures. Owners of small food businesses can also benefit from developing their knowledge of HACCP. This one day course is for individuals working in, or planning to work in, food retail environments, such as supermarkets, corner shops or premises with hot & chilled food display counters. This three day course is for individuals working in or preparing to work in a supervisory role within a food manufacturing workplace. This three day course is for individuals working in or preparing to work in a supervisory role within the catering industry. 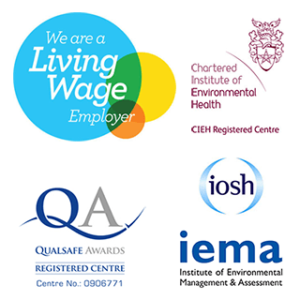 We are also approved by the CIEH to deliver the same courses listed above under Qualsafe Awards. Listed below are a selection of courses that ADL Associates Ltd can deliver for you employees. As we are unable to alter the content of the nationally accredited courses listed above, we offer in-house courses as another option and we can add the bespoke content needed to meet your organisational requirements. How to specifically avoid the risks from asbestos. In addition to understanding COSHH requirements (see below) employees should have a basic awareness of chemical safety. This course will identify and assess hazardous substances in the workplace. The course will enable you to put together plans to prevent and control these substances so that your business and your employees can work safely. As the health and safety performance of the construction industry continues to increase and with ever strengthening legislation, this course will enable all organisations and their employees to strengthen co-operation and co-ordination and encourage better integration. Additional duties for notifiable projects. All organisations today have a legal requirement to ensure their staff are adequately protected from the risk of injury due to incorrect use of office equipment or inappropriately supplied equipment. Eye sight and instruction and training. During and after a serious fire – the recovery plan. Work at height standards and requirements. If you haven’t found the course you need, please do get in touch. We can design a bespoke course to suit your individual risk profile or business needs.